Do you and your students get totally frustrated when you're unable to give them individual help? I'm Sandy with Sweet Integrations. 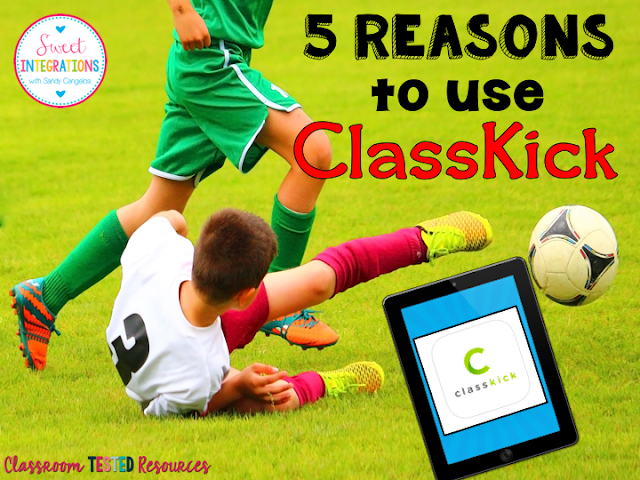 I'm going to give you five reasons to use an app called ClassKick. It's fairly new and has received high ratings. The app is so easy to use and you will be able to integrate technology with no problems! 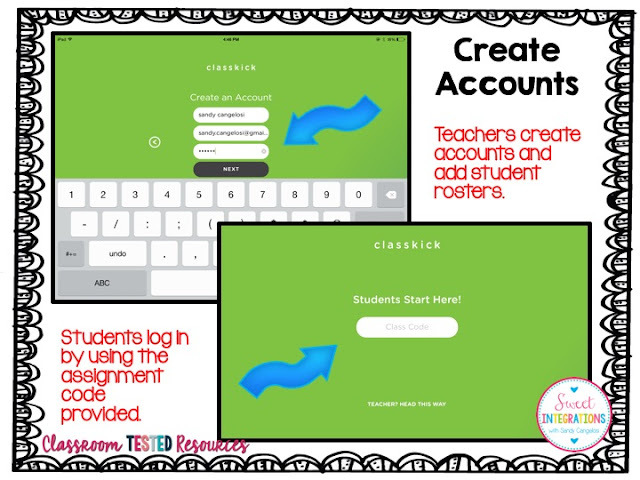 Just create a teacher account and add your student roster. 1. Use your own lessons - Teachers can create their own lessons with for almost any subject using their own worksheets, web content, audio and video. 2. Work in real time - Teachers can see the whole class working at once on his/her device and see how each individual student is performing. The teacher is able to identify struggling students or students who are too shy to ask questions. And, students can work at their own pace. This is perfect for your higher level students. 3. Students can ask questions and raise their hand privately by just clicking on a button. The teacher can even reteach a concept on the device so the whole class can see. 4. Students can get help from other students - ClassKick is designed so students can help their peers. This feature helps them stay engaged even more. Students can even use ClassKick from their device at home. 5. It's FREE - You can download this app at no cost. It's totally free for you and your students. 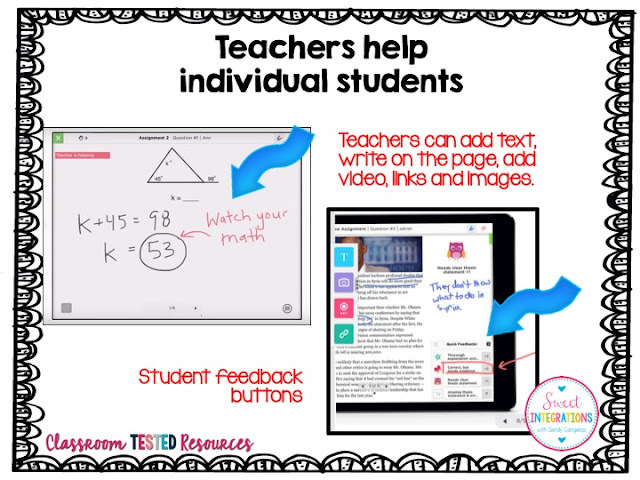 I like Classkick because teachers can create the lessons, students work during real time and they can receive instant feedback as they work. Classkick is an also excellent resource for review. After the teacher creates an account, there are several step-by step tutorial videos to watch before actually creating assignments. Teachers can then add their students to their roster. Screenshots can be added from your google drive, the web or images from your camera roll. Images can be cropped and rearranged to fit on the page. Text, audio and video can be added to the workspace and links to websites. Next, students are given the class code so they can complete the assignment and so their instructor can view their work. I can imagine so many uses for this new app. Teachers can use ClassKick for social studies, math skills, reading comprehension, and review for tests. I love how students can get immediate feedback and work closely with their classmates. 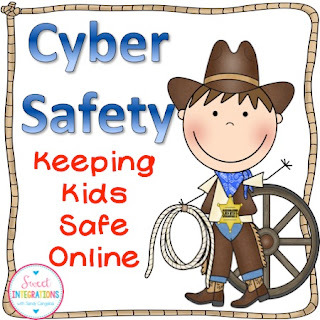 If you're looking for Technology Safety Tips to begin the year, try my Keeping Kids Safe unit. Sheriff Cyber Sam has lots of activities for Internet safety. Fantastic post. I love how you walked through how it's used. This will be very helpful.